With Christmas and New Year fast becoming a distant memory I can finish the series of posts I began about our short sojourn in the beautiful South West region of WA at the end of our winter (see here, here, here and here for earlier posts). We have enjoyed coming down to this beautiful area for many years now. 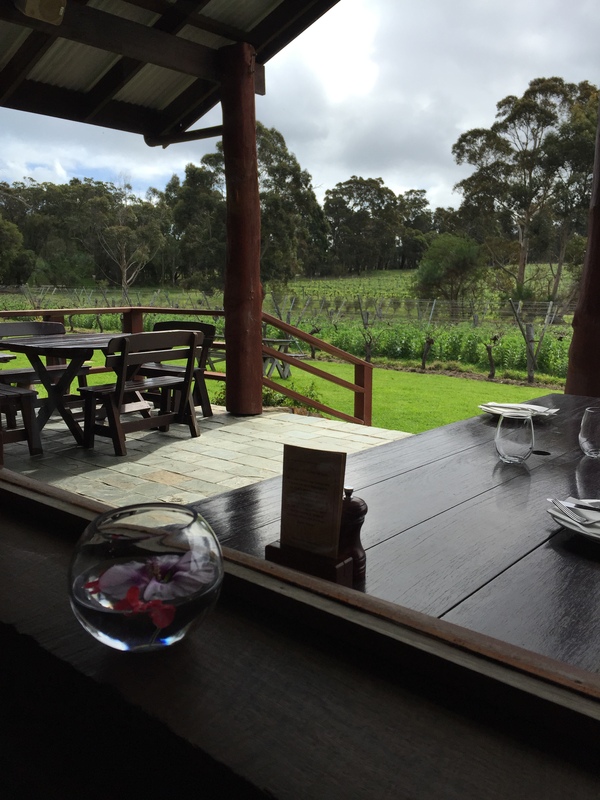 On our first visit, way back in 1992, we had a superb and memorable lunch at Cullen Winery in the Wilyabrup locality on Caves Road. Monsieur Le Chic decided some wine tasting was the order of the day, whilst I endeavoured to keep our 2 little girls occupied! An elderly lady was standing by the bar and before I knew it she had asked to hold our younger daughter (9 months old at the time) – she was evidently an experienced baby minder because baby “Mlle”, normally something of a handful, happily smiled and cooed away to the delight of the old lady. The point to this preamble is that we were told in hushed tones by the bar staff (once she was out of earshot!) that this was the winery owner, “Mrs Cullen”. She and her late husband, Dr Kevin John Cullen, had overseen the first planting of vines on their property in 1966 and subsequently founded the vineyard in 1971. They were pioneers of the wine industry in the Margaret River region – award-winning “wine royalty” . The late Diana Madeline Cullen was the most humble unassuming person you could ever hope to meet and we have always treasured that interlude all those years ago! She led an amazing life, not only helping to establish the winery, but being the chief winemaker until her retirement in 1989 when she handed over her duties to her daughter Vanya. Along the way she raised 6 children! Her biography on the Cullen web page says she was once described as ” “an inspiration in our own time and that of future generations”. Therefore we always make time for a lunch and a spot of wine tasting at Cullen whenever we’re down in that neck of the woods. On this brisk late winter’s day, we were not disappointed. We turned up mid week without a booking and part of the restaurant was taken up with a touring party. They were not obtrusive, however and we were rewarded with a lovely table for 2 overlooking the beautiful gardens and vines. Produce is local and as much as possible is picked fresh from the vegetable garden. My fish stew, one of the daily specials was beyond superb, the sharing plate starter including locally caught sardines, wonderfully tasty and the desserts simply divine. All washed down with their beautiful wines. I can only say we have never had a bad meal at Cullen! Naturally after such a superb repast, Monsieur felt it would be only right to sample some of the wines available for tasting, whilst yours truly “the designated driver” relaxed by the log fire. The information signs on the wall caught my eye – Cullen has been Certified A Grade Biodynamic since 2004 . I hadn’t really understood what this meant in practice before our visit but in addition to the information board, Monsieur was given a thorough explanation by the staff as he tried to decide which of the many wines on offer to buy. Intrigued by the name, he decided to try their celebrated “Moon Opposite Saturn” wine. Planting, harvesting and wine production at Cullen are all conducted according to strict principles based amongst other things around lunar cycles and the position of the planets (hence the Moon/Saturn configuration). As for Monsieur’s tasting deliberations he ended up with a mixed crate including a couple of bottles of the “Kevin John” Chardonnay – not normally a fan of Chardonnay but this one is very different in flavour to others I’ve tried. Monsieur’s wine collection back home also includes a few bottles of the “Diana Madeline” Cabernet Sauvignon, which is being cellared for future quaffing! Our curiosity piqued by talk of planets and moon cycles, we headed off into the grounds and gardens to discover more. Stay tuned for Part 2 of our visit next week! Definitely Gin – I love looking at the pretty labels on the wine bottles too! It’s an important part of the strategy to sell the wine – having said that the flavour and taste is important too!! Yes that is the problem – you have to take pot luck to some extent in the supermarkets (or bottle shops here). I wonder if anyone ever tries to sample them on the shelves ..!! Nothing would surprise me! Always find it amusing when I go with my dad to do his weekly shop at Sainsburys and we can buy our wine off the shelf! Here you can only buy wine from bottle shops – it is not allowed to be sold in supermarkets! Sounds and looks like the perfect lunch spot Rosemary, love the story about the owner and your daughter too, a special memory. Really interesting about the lunar cycles and their adherence to that as well, just told my husband about all this, he is the wine buyer in our house and has already been investigating Cullen wines, seems like we might be getting our own mixed crate!! It’s a wonderful spot Joy – no matter what the season it’s such a lovely place! We had no idea at the time who the lady was, who took such an interest in Mlle, all those years ago That special welcome has kept us going back time and time again (as well as the wonderful food and drink!). It’s a very friendly and welcoming place and the wines .. well they are superb! I would be really interested to hear how you find the wines if you end up getting a selection! Am sure they’d ship to the UK – most of the wineries down in the Margaret River region do as indeed do wine outlets the world over!! Santé! Love a good winery and good food! Mrs. Cullen sounds like an amazing person. It’s always a winning combination isn’t it – wine and food in a lovely location! That first visit really made an impression on us – Mrs Cullen was such an engaging person but so humble – really I was amazed when I read up about her life and achievements. How she raised 6 kids at the same time is beyond me! What a gorgeous spot! I’ve never seen an unattractive vineyard but this one is exceptionally pretty. The meal looks very fine, too. What a lovely story! I felt quite emotional reading that. I can understand why you want to keep going back after making such a personal connection (though it looks wonderful anyway). Margaret River is on my to-do list if we ever make it back to Australia. I have happy memories of wine tasting in the Hunter Valley, my only other experience of wineries / vineyards being in France, and they are so different! Thanks Anabel – am so glad you loved the story – it was really a very special encounter with a charming person and one that has stayed in our memories 🙂 We have gone back with Mlle as a grown up as well and she loves the place too! Yes you should definitely come to Margaret River if you come back Down Under – the region has resemblances to France in my view with the rolling green pastures and vines but the Jarrah and Karri trees and architecture give it a different appearance (no medieval hilltop towns down here!). Have never been to the Hunter Valley but hear it’s beautiful. We have, however, been to the Barossa Valley near Adelaide and the Yarra Valley in Victoria – both are excellent wine producing regions too! Yes you would definitely be spoilt for choice down in the Margaret River area Anabel! Yes a private driver would be great – I was driving on this occasion so of course I couldn’t sample much. There are a quite a few wine tasting tours you can do down in the south west though we haven’t personally done any of them. Gosh that’s no good having a leg in plaster on your hols!! Looks like a delightful place. Nothing better than a visit to a favourite vineyard. Love the astronomy connection too. Thanks Ruth yes it is a delightful spot! If you come over to WA try to head down Margaret River way – it is well worth it and not too far (3 hours drive south of Perth). The astronomy connection was fascinating – more to follow in Part 2! I am always happy to visit a winery, this one sounds delightful and the food impressive too. Thank you Rosemary, I had fun exploring Western Australia with you, only wish I was there in reality. Hoping that next year I will be! Kids moving from Freo in to a house, but I don’t know where yet, Freo too expensive for a house and the town house they were in was getting difficult with a toddler. Always a lovely place in which to wile away some time…very leisurely pace of life down in the south west such a contrast to the city! I love the Margaret River area, one of my favourite places on our round Aus trip. This was the winery we visited https://pommepal.wordpress.com/2010/11/04/wine-country-in-margaret-river/ I wished we’d had time to explore the area more. Your lunch and winery visit was so special. Are the fires in that area under control now? I liked the Perth climate when we were there, not as humid as Queensland. Pleased to hear the fires are now under control. What a great looking place – and the food looks delicious! No wonder you keep going back.